Happy Home Imitation Butter & Nut Flavor, Imitation Baking Flavors: Southern Flavoring Company, Inc. The salty, smooth flavor of butter is combined with the rich, savory flavor of nuts in our Happy Home Butter Nut Flavor. Use this flavor in breads, cookies or cakes. Great taste, value, and speedy shipping. Your site was easy to navigate and I am 100% satified with your products and pricing. Thanks. McCormick recently discontinued the Vanilla Butter & Nut flavoring I'd used for years. I was afraid I'd never be able to make the cake again but found the Happy Home brand & am thrilled the cake turned out perfectly. If you're used to the McCormick brands bright yellow color you can add a couple drops of yellow food coloring to achieve identical results. This is an excellent flavoring & I can't recommend it enough. Product was clearly presented, mailed promptly and efficiently, and was what I wanted and expected. I had searched everywhere for the butter and nut flavoring. I found it!! I have ordered the Pure Madagascar Vanilla, Lemon extract, and Butter and Nut flavors in the past through fund-raising events. I have and am still pleased with the flavors, the quality of the products, and the results received when using the flavors. Thanks so much!! I love putting a few drops in my coffee in the morning, it makes it so rich and delicious! Owner Response: Susan, Love this suggestion! Thanks for sharing and being a valued customer! So glad I was able to find this product from your company. Vanilla Butternut is difficult to find, so I ordered a case from you! Made my Butternut Pound Cake the day I got it. It is nice to be able to keep my mother's tradition alive by making this yummy cake. Thanks! Michelle D.
This flavoring is the best I have ever had. It goes well with many recipes. We make homemade Ice Cream (ButterPecan) we use butter and nut flavoring in it . It gives the ice cream the perfect taste along with toasted pecans. Everyone loves our ice cream! Owner Response: Mmmm mmmm good! Thank you for accommodating our special circumstances recently. Our mother in law was elated when the package of her special ingredient arrived in the mail. Shipping was faster than expected and right on time since she had just used the last of her supply the day before!! Maybe we can talk her into sending a special treat your way the next time she is in town. Owner Response: We were happy to help! We're hungry just thinking about getting some goodies made with Happy Home Flavoring! Happy Home Southern Flavoring takes me back to my youth when I baked holiday treats with my Granny Sharp. She cooked in local restaurants. Pies and cakes were her specialty. Happy Home extracts were her choice of flavorings and they are still excellent today. Owner Response: Thanks Ms. Mack for your review of our Happy Home baking flavors and extracts! Owner Response: Thank you so much for the review, Shawna! We love hearing stories such as this! I have found your flavorings to be of the highesst quality. My cakes always turn out so delicious and flavorful. I use your flavors in all my cakes. This flavoring is my favorite. I call it my secret ingredient. Good for cakes, pies and, sweet potatoes. Very fast shipping also. I LOVE, LOVE, LOVE Happy Home!!! I have used Happy Home Butter & Nut flavoring almost exclusively for years! My family and friends always want to know what my secret is and I am happy to share it! Recently I have had to order from your website because we have moved to an area where I can't find it locally in the stores. I am glad to have found your website! Thanks - I LOVE, LOVE, LOVE this product!!! Use this flavoring in my pound cakes and everyone raves about the flavor. I also give bottles of this and the Butter Flavoring as little gifts to my friends on special occasions. They love it. Bake goods need characteristics! For this reason I use butternut flavoring. I use butternut flavoring when I bake and love the way it brings out all the flavors in my special pies. It adds sweet and salty flavoring. Never disappointed! The quantity for the price is great, the shipping wasn't horrible, and my order arrived quickly and in great condition due to great packaging! Thank you! I ordered a case of the the butter nut extract. And it came the next day. I was thrilled and excited. Great service keep it up. This is my secret ingredient to my cookies and more and was devastated when my grocery store stopped carrying it, but that gave me the opportunity to find you guys. I bought a case and I know I'll be back for more. I actually ordered the Happy Home flavoring for a friend. She specifically likes the Butter and Nut in her oatmeal. We went all the way to The Cheese Shop in Stuarts Draft Va. to get it and they had every flavor but that one. She had looked previously as well and resources that had the Happy Home Flavor did not Butter and Nut. I gave it to her as a little present and she was happy I had found it for her. She does not have a computer so I got the catalog for her as well. Thank you for your prompt delivery. I'm a very satisfied client. I have not been able to find butter and nut flavoring in any store in my area. My daughter ordered me and my two sisters a case to share. We're very pleased with this flavoring. Fast service. Always faster than I expected. I use this flavoring with amazing results in my Sour Cream Pound Cake. The cake receives rave reviews. I share the flavoring with my friends. I have not found it available in my area. The shipping was great! 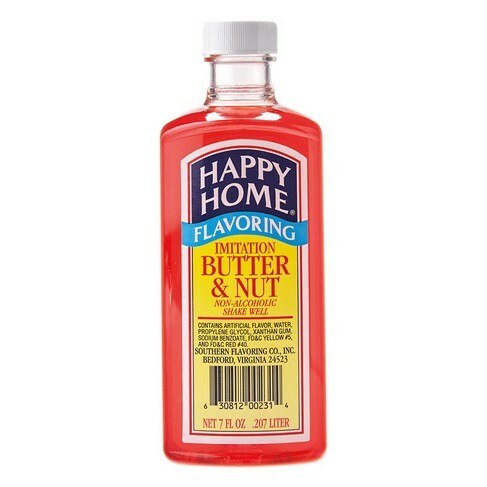 Happy Home Imitation Butter Nut Flavoring is a staple in our household. It is the perfect flavoring for pound cake. My daughter-in-laws love the cake so I have ordered additional bottles for them. You can't go wrong with this one! My aunt introduced me to this flavoring in a pound cake so delicious that I had to have that flavoring! She sent me a bottle every now and then, whenever a church group was selling it as a fundraiser. Erratic, and it seemed I was a always waiting on a bottle of this! That tip about the yams with the Butter Nut flavor, can't wait to try that! Thanks! Brings back memories for me, and I can't keep the pound cakes on the plate, I make two at a time and still, they go so quickly! Thanks!